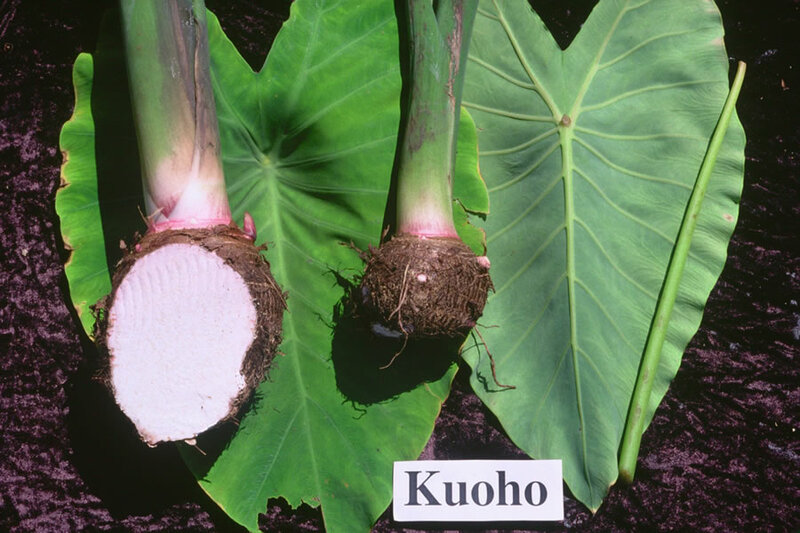 General Characteristics: Medium in height, moderately spreading, maturing within 9 to 12 months, producing from 5 to 10 oha; distinguished by very dark green petioles with indistinct, narrow pinkish edges. Petiole: 65 to 80 cm. long, dark green with an indistinct, narrow pinkish edge, a dark pink ring at base with light pinkish area for 1 to 3 cm. above. Leaf blade: 35 to 45 cm. long, 25 to 30 cm. wide, 25 to 35 cm. from tip to base of sinus, narrowly sagittate, dark green; margins slightly undulate; piko light yellowish; lobes acute with wide sinus. Corm: Flesh white with light pinkish tinge, especially near apex, the fibers yellowish; skin light pink, purplish along leaf-scar rings. Origin, and derivation of name: Native variety; kuoho means "fish hook," but the source of the name is unknown. Distribution: A great favorite in Puna, Hawaii, but seldom seen elsewhere; grown mainly under upland culture. Use: Makes smooth, light-colored poi of good quality.